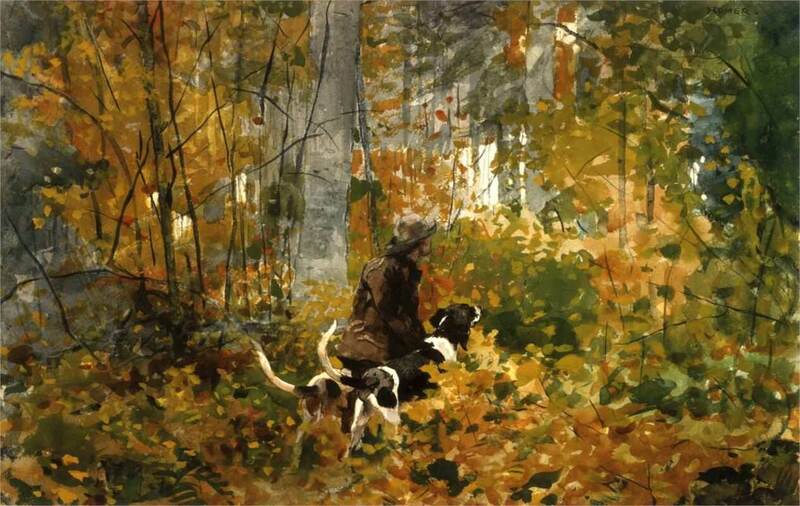 In 1889 Homer began a series of watercolors on deer hunting in the wilderness of the Adirondacks. One method, called hounding, involved using dogs to track and chase the deer. The guide or hunter would enter the forest with a leash of hounds attached to his belt, and release one dog at a time, allowing it to run in ever-widening circles in search of a deer trail. When pursued the deer instinctively takes to water, where the dogs cannot follow the scent. The hunter waited in a boat and would overtake the deer once it had entered the water, then shoot or club the animal. Hounding was a controversial practice. Still-hunting, where the hunter tracked the deer through the woods without the benefit of dogs, was considered more sportsmanlike. However, Homer's hunters are not wealthy sportsmen, casually shooting for entertainment, but local guides hunting for food and livelihood. On the Trail shows a young woodsman at the start of the hunt, holding two lively dogs, their tails twitching in anticipation. Copyright © 2009-Present www.WinslowHomer.org. All Rights Reserved.